One Night in Indy is a 2016 live album released by Resonance Records featuring Wes Montgomery and the Eddie Higgins Trio recorded in 1959. Following the 2012 release of Resonance’s archival set Echoes of Indiana Avenue, author, photo journalist, and private collector Duncan Schiedt approached the label to see if they’d be interested in releasing a live tape of Wes Montgomery he owned. It was a 1959 set where the guitarist sat in with the Eddie Higgins Trio, then featuring drummer Walter Perkins (and also an unknown bassist). Resonance arranged for the rights and released One Night in Indy in 2016. Montgomery’s star was just beginning to rise – he recorded two sessions for Riverside in 1958 – and Higgins established himself as an attraction on the Chicago circuit but, at this time, they were essentially operating on the same level of stardom and, appropriately enough, this date showcases them equally, with Montgomery’s rich runs nicely accentuating the elegance of Higgins. If the audio is a little rough at times – the set was recorded on a homemade recorder in 1959, after all – the performances never are: even when the tempo starts cooking on “Stompin’ at the Savoy,” this music rolls easy and the appeal is that mellow yet lively interplay, as each leader seems to want nothing more than to play off of the other (http://www.allmusic.com/album/one-night-in-indy-mw0002836451). 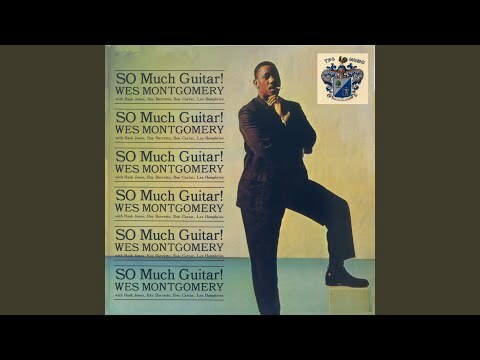 Wes Montgomery - So Much Guitar!